Teeing the ball too high is one cause of skied shots. Of the many problems that can afflict novice golfers, one of the worst is skied tee shots. The ball flies high in the air, costing golfers valuable yards off the tee, leaving long approach shots into the green and ballooning scores. The key to fixing skied shots is understanding what happens during the swing and correcting the flaws. Skied shots can be caused by a steep swing arc. The golfer comes down on the ball similar to the swing of a wedge and forces the ball straight up in the air. To help cure this, when taking back the driver, focus on bringing the club head back low and slow. This will help reinforce the thought of a more elongated swing arc and keep the club from coming down sharply on the ball when making contact. One easily fixed cause of skied tee shots is the height of the tee. 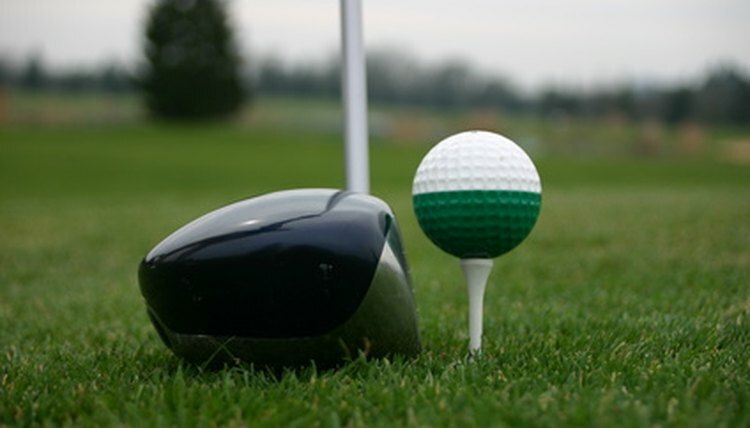 When the ball is teed too high, the golfer is unable to make solid contact; the club head only makes contact with bottom half of the ball, lifting it high into the air. Tee up the ball slightly lower, with the top of the golf ball sitting just above the top of the driver at address. This will create better contact with the sweet spot and eliminate skied tee shots. If skied shots are a recurring problem, one culprit might be ball position. When using a driver, you should generally play the ball off the inside of the front foot (left for right-handed golfers). If you play the ball too far forward, you hit the ball on the way up in the follow-through. Move the ball back slightly in the stance, taking notice of the ball’s position relative to the heel of the front foot. The reverse pivot can be another cause of high shots off the tee. With a reverse pivot, a golfer has their weight on their front foot during the backswing and their back foot during the follow-through--the exact opposite of a correct swing. To fix the problem, try the step-through drill. On the driving range, take a swing and after following through, take a step toward the target. This will emphasize moving weight forward during the swing. When attempting to fix skied tee shots, see if the problem can be fixed by teeing the ball lower or moving the ball slightly back in the stance before attempting more complex swing changes.